It took just 9 minutes a full debate about Volkswagen reliability to show up in a story about the 2015 GTI. That's not totally unexpected after other debates on German car reliability. But I hate to break this to all of you: if you're looking for a truly reliable car in its class, you don't have much to choose from. 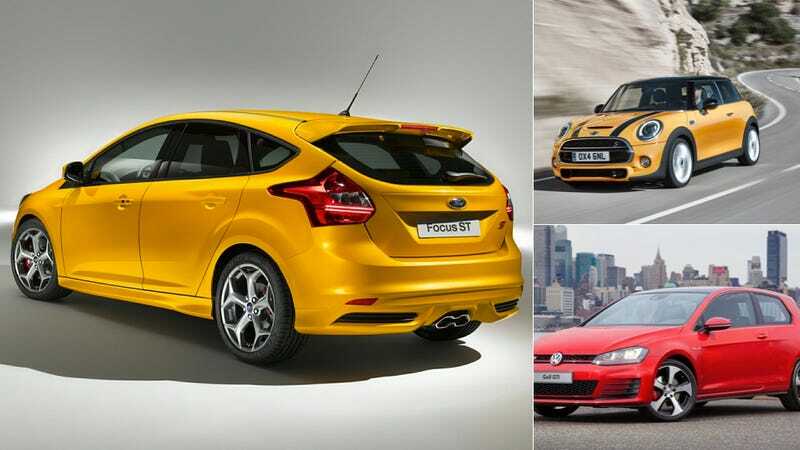 Never heard of the Focus ST? $24k, same size and will be reliable. Well, probably not more reliable than a VW or a bunch of other fast hatches and their competitors on the market. There's no breakout for the Fiat 500 Abarth, but normal 500 versions are near the bottom of CR's reliability rankings. Honestly, you could pretty much make the case for unreliabilty for any car if you look at enough forums and NHTSA complaints. But when looking at actual surveys and data from consumer reports or J.D. Power, this whole category doesn't strike as a particularly dependable one. And let's think about this. If total reliability is what you're looking for in a car, you shouldn't be shopping in this segment. All of these cars have a raft of electrics and sensors to keep power where it should be. Most have turbos. And they're all essentially top-trim cars that have all the power features and more complex radios. Cheaper, lesser-powered and lesser-equipped variants of the same cars are the probably way to go if you want fewer problems. Is outright reliability what you're looking for when you're buying a hot hatch? I don't think so. You buy these cars because you like the way they drive, you like the looks and you like the way they make you feel. That could be worth a few headaches. Up until the dash lights up in warning lights, of course.